As more tangible signs (both literal and figurative) begin to appear along the Southwest Waterfront confirming that construction is imminent on phase one of the billion dollar Wharf development, whose groundbreaking is scheduled for March 19 at 11am, let’s take a brief look back one last time at the portion of the Southwest Waterfront that soon will be history. A large Coming in 2017 sign will likely be installed here at 9th St & Maine Ave.
Phillips Flagship occupies roughly where Parcel 2 will be built. An entertainment venue called Wharf Hall with capacity for up to 6,500 patrons, along with a co-generation plant and two mixed income apartment buildings (several with micro units), will replace Phillips Flagship. 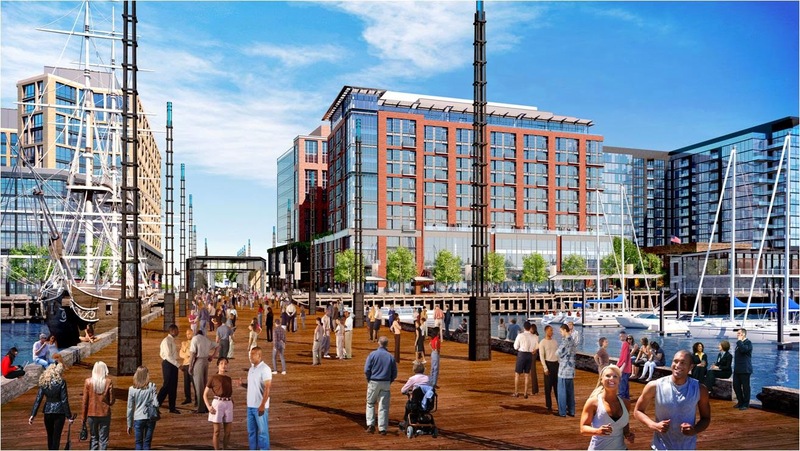 A Transit Pier will be built nearby to serve water taxis and can accommodate several roles, such as an ice skating rink in the winter and (with the addition of barges along its sides for seating) a stadium for the Washington Kastles, if they choose to return. The building which houses the Capital Yacht Club and Jenny’s Asian Fusion will make way for a temporary parking lot (or an office building if an anchor tenant can be found – at one point The Wharf was a contender for the new Washington Post headquarters, although it is unclear if that is still the case). Transit Pier in foreground and Parcel 2 located to the left. 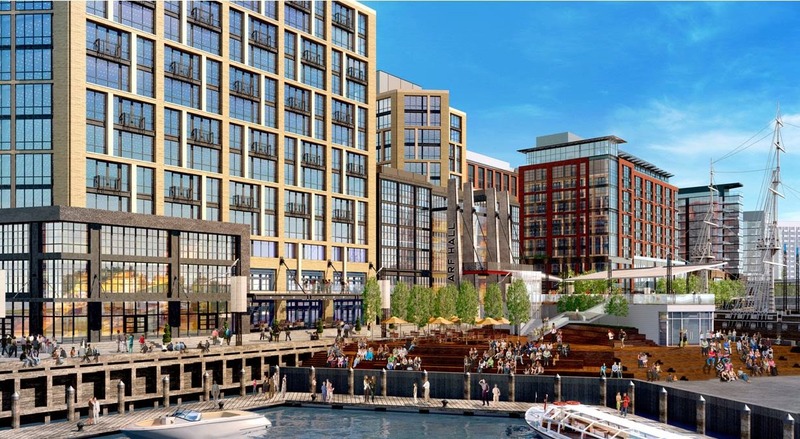 The plaza where 9th Street dead-ends at Water Street will be transformed into District Pier, a 650-foot pier that will start at Maine Avenue and extend out into the Washington Channel. District Pier will be where tall ships dock and the Dockmaster building will be located at the channel end of the pier. 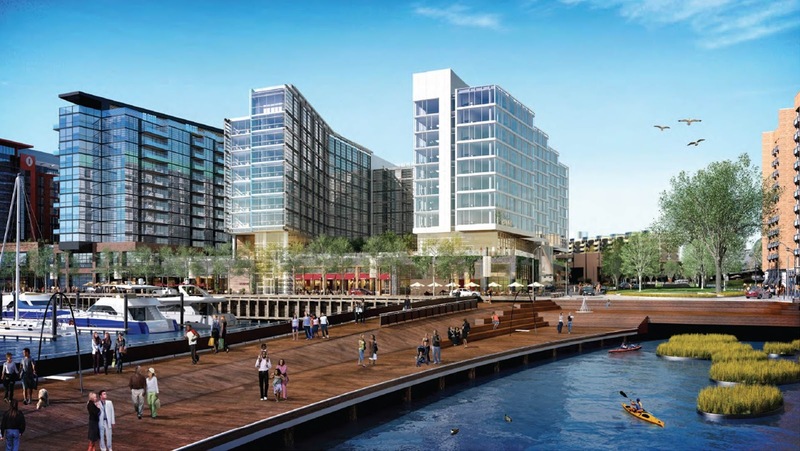 On the land side, District Pier will serve as the area where visitors will emerge from the parking garage and begin to interact with The Wharf with retail shops and cafes. Future site of District Pier. District Pier and Intercontinental Hotel from the Washington Channel. H2O Nightclub/Hogates was torn down nearly four years ago and was replaced temporarily by Kastles Stadium. The stadium was in place for three years and during that time, the Washington Kastles won three Mylan WTT championships and lost only once at home during that stretch. Kastles Stadium has been dismantled and will be replaced by Parcel 3, an office building and an Intercontinental Hotel. The office building will face Maine Avenue and the hotel will be on Wharf Street, a woonerf (a Dutch term for a street where pedestrians and cyclists have priority over vehicles) that will run along the length of the waterfront, with areas for outdoor café seating, a promenade, and limited vehicular traffic. A new Capital Yacht Club will be built adjacent to the hotel on the Wharf Street side. Next door is Parcel 4 which will be a mixed income apartment building facing Maine Avenue and a luxury condo building facing Wharf Street. Hogates was demolished in 2010. Kastles Stadium opened in 2011. Parcel 3 office building along Maine Avenue. Its days as a nightclub are long gone, but Zanzibar still stands (I remember taking salsa lessons there several years ago on Wednesday nights); however, it will face the wrecking ball later this year. In its place will be Parcel 5, two hotels to be developed by the JBG Companies – an Element hotel and an Aloft hotel, both being Starwood-branded facilities. 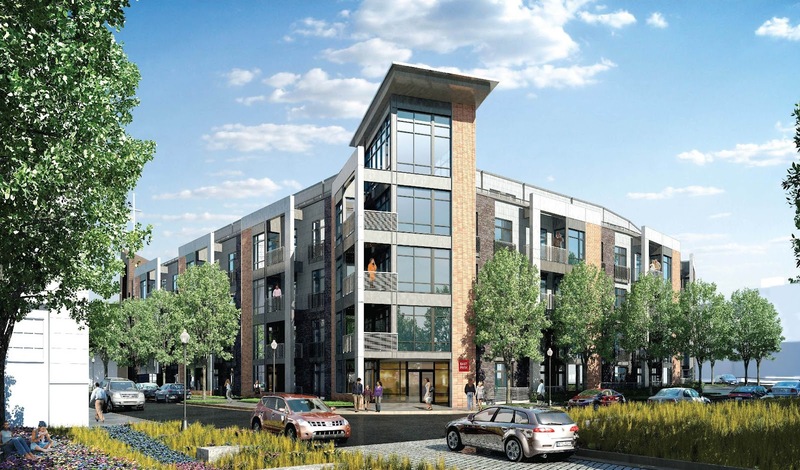 A series of mews will connect the parcels, along with music venues in Jazz Alley that will be located between parcel 4 and 5. 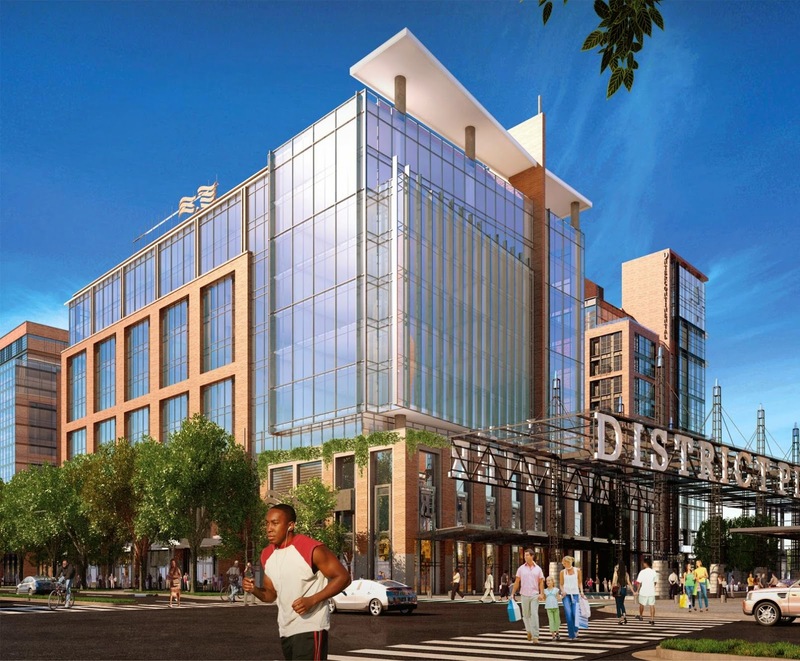 Retail will be on the ground level of each building on both the Maine Avenue and Wharf Street sides. View of Parcel 5 hotels from the Washington Channel. A forlorn plaza where 7th Street dead-ends with Water Street was given an extreme makeover by Hoffman-Madison Waterfront in 2010 and became 7th Street Landing. Several events were programmed here during the warmer months, including jazz and blues performances, a farmers market, yoga, food vendors, and other activities. This park will become 7th Street Park, a formal green space that will serve as a front lawn for the two hotels adjacent and will be next to a to-be-built recreation pier. 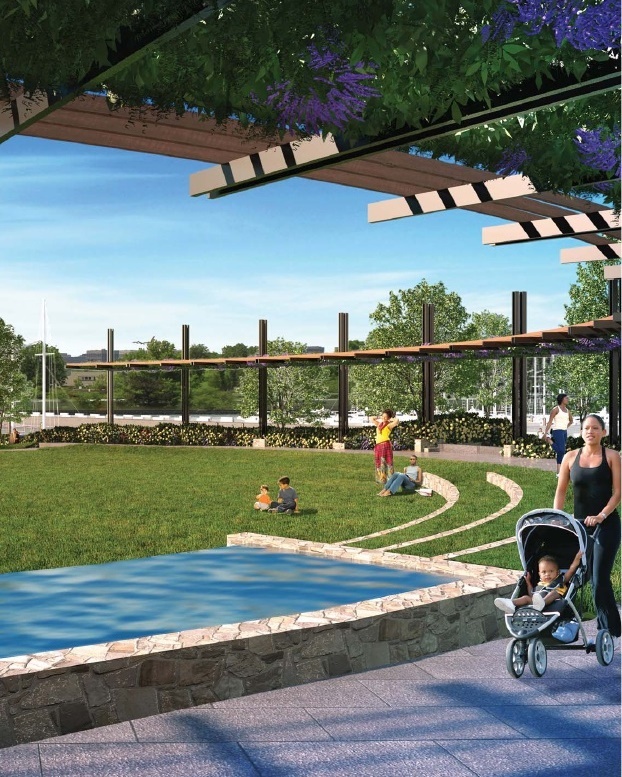 Once construction begins at the Wharf, the activities that used to take place at 7th Street Landing will be moved over to Gangplank Marina Park, which is not a part of phase one of construction. Ward 6 Council member Tommy Wells held his final monthly Southwest office hours last week at the infamous Channel Inn Hotel, which will close at the end of this month so renovations can be made to accommodate the construction team and serve as the temporary home for the Capital Yacht Club. Jenny’s may also open a smaller restaurant on site. The building will eventually be demolished in phase two of development for an office or residential building. St. Augustine’s Episcopal Church will be closing this summer in anticipation of demolition and construction of a new sanctuary at Parcel 11, along with a mixed income mid-rise condo building. This parcel will be the first component of phase one to deliver – which should take place sometime in early 2016 compared to the rest of phase one that will not be completed until at least the second half of 2017. Next door will be a new 3.5-acre waterfront park, replacing the large parking lot that is used for the dinner cruise ships. The businesses to the southeast of the Channel Inn, including Cantina Marina and the dinner cruise ship operators, will continue to operate normally during phase one. The Maine Avenue Fish Market will also remain open during construction and will be fixed up a bit. The liveaboards on the northwestern side of the Gangplank Marina were moved late last year further down so the bulkhead on that side of The Wharf development can be rebuilt and new docks installed for the Capital Yacht Club. What memories do you have of the Southwest Waterfront? Thank you for the complete coverage. As I recall, one issue was commercial bus parking. How, if at all, was this issue resolved? On a related note, where will visitors to the cruise ship lines park once the new community park is constructed next to St. Augustines Church? The buses will load and unload along the portion of Water Street that will remain open (east of 7th Street). Once phase one opens, visitors can park in the Odyssey parking lot, or in the new parking garages at The Wharf, or on Maine Avenue, or take public transit.